Metro Super Erecta Preconfigured Units come prepackaged with 4 shelves and 4 split posts for ease of shipping and assembly. Furthermore one piece solid posts may be substituted for split posts if out of stock. Finally. all components come in a single box, therefore shipping is easier and less expensive. 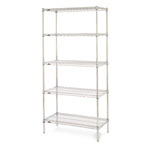 Furthermore, Super Erecta Convenience Pak provides a complete shelving unit in a single box. Easy to order alternative to seperate shelving components. Available in Super Erecta Brite, chrome, and Metroseal 3 finishes. Because this is the original wire shelving system, you can be assured of uncompromised reliability and flexibility. Furthermore Super Erecta is a strong design: up to 800lb. (363kg) evenly distributed per shelf. So they are easily configurable for stationary, mobile, or wall mount applications. Above all, the unique shelf design minimizes dust accumulation and allows a free circulation of air. Similary, there is a variety of accessories will contain, identify, organize, and transport supplies. Metro Super Erecta Preconfigured Units come prepackaged with 4 shelves and 4 split posts for ease of shipping and assembly. Furthermore one piece solid posts may be substituted for split posts if out of stock. Finally. all components come in a single box, therefore shipping is easier and less expensive.